Infuriated by the ousting of Mussolini in July 1943, Hitler ordered his minions to plan and execute the kidnapping of Pope Pius XII and the plundering of the Vatican’s treasures. Kurzman, who specializes in war and disaster (No Greater Glory, 2004, etc. 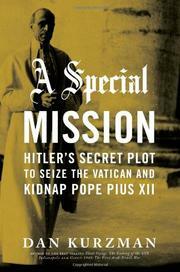 ), believes he has found the key to understanding Pius XII’s reluctance to condemn the Holocaust. Although no official Nazi documents have emerged to confirm the story, numerous interviews of the principals leave little doubt that Pius XII was concerned that his active opposition to the Germans would seriously threaten the Church (especially in Germany), the Vatican and his life. Although Kurzman does not specify when he conducted his interviews, he mentions them frequently, especially key ones with SS General Karl Wolff, a man whose hands dripped Holocaust gore, but who nonetheless recognized the folly of Hitler’s seize-the-Vatican order and who realized that Germany was going to lose the war and was hoping to accommodate himself to the ensuing new world order. He initially hoped to broker a separate peace—to convince the Allies (the Western ones) to focus on the Soviets, whose post-war imperial designs were evident. That initiative went nowhere, but Wolff did surrender the entire German army in Italy two days after Hitler’s suicide. The author at times relates this story in a sort of breathless prose (using exclamation points in case we miss the urgency), and he seems oddly hesitant to denounce outright Pius XII’s behavior (including his failure to speak out when the Nazis rounded up the Jews of Rome and shipped them to Auschwitz), leaving that job to other historians whose judgments he records. Of greatest interest is Wolff’s delicate dance: appeasing the ever-impatient, impulsive and dangerous Hitler; finessing the frightened Pope; protecting himself and his family. A little-known tale whose significance the author trumpets a bit too brassily.